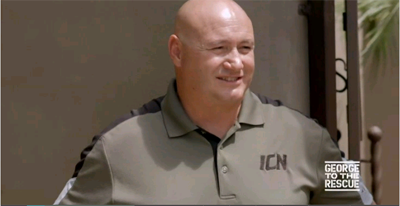 ICN is proud and honored to be featured on a recent episode of “George To The Rescue” on NBC. The episode was a home remodel for Olympic Gold Medalist, Amy Van Dyken-Rouen, the Olympic swimmer who was paralyzed in an atv accident. Watch the whole episode here. Independent Contractors Network (ICN) is a restoration and home remodel company that has been helping home owners and business owners in Arizona since 1997. We specialize in damage restoration and remodeling of homes and commercial properties. ICN knows how hard it can be for a owner when you home has been through a fire or flood. We take great pride in bringing your home back to life and knowing that we have done the job correctly and quickly to ensure your families safety. We are a general contractor and can take on the smallest of remodels up to building an entire house if you so desire. It is a real joy to sit down with homeowners and help them design their home remodel and bounce ideas off each other. The owners of ICN have over 45 years combined of experience in the restoration field. There nothing we haven’t seen or dealt with before and because of this we are fast acting and problem solvers. We have professionals ready around the clock to take your emergency calls. We can help you make quick decisions to minimize the damage over the phone while we are on our way to your home or business. ICN will provide a free estimate by one of our experienced estimators. We can also help you decide if it’s worth putting in a claim to your insurance comapny. Sometimes the damages are less than your deductable and we can help you determine this which will save you time and money. ICN will work directly with your Insurance Co. to make sure you are getting your loss taken care of. We can assist or write the scope of repairs needed to get your home whole again. We have a team of estimators that are very detailed orientated to make sure all items have been accounted for and nothing is missed. ICN can bring your home back to life again by remodeling your kitchen, bathroom, room additions, detached and attached garages, patios to name a few. Our emergency service include water extraction and water mitigation, board ups, roof tarps, and temporary fencing. We will make sure your home is protected when damage occurs. If your home has been damaged by wind, fire, or flood, let ICN provide you with a free estimate to repair your home.